Widespread landline and cellphone outages hit Bell's network in Atlantic Canada for several hours Friday, disrupting air travel across the region and hampering some people's access to emergency services. A widespread landline and cellphone outage that hit Bell's network in Atlantic Canada and disrupted air travel across the region was caused by accidental damage to fibre lines. Bell Aliant said the outage affected internet, wireless, television and landline phone services, and began around 11:20 a.m. AT Friday. The company said service was fully restored after repairs to its infrastructure around 4 p.m. AT. "The outage was caused by accidental damage to multiple fibre network links. Bell apologizes to our customers for the disruption," said Nathan Gibson, a spokesperson for Bell Canada, the parent company of Bell Aliant in a statement. Later Friday Bell Canada said on Twitter that two major fibre links had been cut during third-party construction work. Telus, which shares cell towers with Bell, said a cut cable caused the outage and affected 885 cell sites across Nova Scotia, New Brunswick, P.E.I. and Newfoundland and Labrador. Users of Virgin and Koodo, which also use Bell's towers, were also affected. A status update from Telus indicated the repairs to a damaged fibre cable took place in Drummondville, Que. Airports in all four Atlantic provinces said some flights in and out of the region were affected by the outages. Dozens of flights were listed as delayed even after service was restored to many customers. Lines formed when Air Canada's computer system went down as passengers waited to be checked in manually. 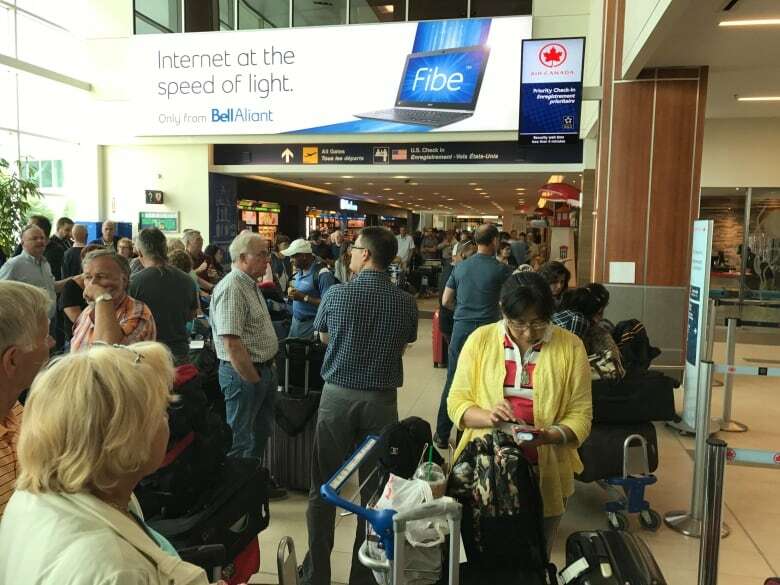 CBC's Julian Brown was in the Halifax airport mid-afternoon and described the conditions as "pandemonium," with hundreds of people waiting for service. Staff from Air Canada were passing out coffee, food and water to waiting passengers in Halifax. In St. John's, Air Canada staff ordered pizza for people stuck in line. The airline said "ongoing computer problems" were affecting service across the region. It is advising customers they can rebook online without additional charges. 2/3: All systems are back up and running but passengers should expect delays and some cancellations for the remainder of the day. Westjet said its Moncton, N.B., contact centre went down because of the outage. The company asked people not to call this afternoon unless it was urgent. Not all phone service was cut off. Eastlink said its service was not affected, but customers could experience problems calling people on other networks. Rogers said its service and Fido's was not affected. Some businesses and banks closed due to problems operating credit and debit machines. TD Canada Trust and Scotiabank closed several branches because of the service disruption and some retailers such as Walmart were only taking cash. Emergency services across the region reacted to the outage, issuing statements asking people to use landlines to contact them if necessary. Officials in Nova Scotia and New Brunswick said the 911 service itself was not affected, but people without service may not have been able to call. Mid-afternoon, Bell said its wireless 911 service was working but landline 911 service was "intermittent." Halifax Regional Police and Cape Breton Regional Police said they were able to respond to calls coming in through 911 and their non-emergency lines. Paul Mason, director of emergency services with Nova Scotia's Emergency Management Office, said 911 operates on a "distinct network from the regular telephone system." He said he didn't know of any cases where someone needed help and wasn't able to receive it. If you’re trying to contact your local RCMP detachment and can’t get through, call 1-800-272-9569 or 902-893-1323. In Prince Edward Island, RCMP also advised people to call using their non-emergency landlines. Bell, Telus phone service restored in P.E.I. 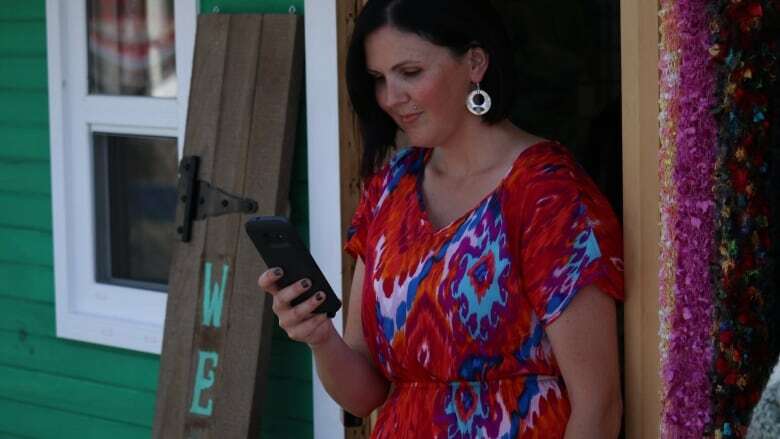 A spokesperson for P.E.I Public Safety said people without service in need of 911 services could use the emergency call feature on their phone, which would connect them to a working cell tower from another provider. In response to the outages, Nova Scotia's Emergency Health Services ordered all ambulances and on-duty crews to return to their stations and monitor their tablets for emergency calls. One rural RCMP detachment in Nova Scotia relocated to a nearby gas station and Robin's Donuts for an hour during the outage. Cpl. Dal Hutchinson said officers in the Guysborough District spent at hour there to ensure they were close to working phones. They moved to the municipal office before returning to the detachment, he said. 911 is still working but the best way to reach it right now is a land line. Halifax Fire also ordered all volunteer firefighters to report to unstaffed stations to make it easier for dispatch to reach them and for people who might go directly there for help. "We were setting up mobile dispatch centres around the municipality inside fire stations where we knew we had a direct line to the dispatch service," he said. Outage outrage: Why can't we cope when the internet goes down?